Do you need Medicare Part B? Can you delay Part B enrollment? Do you need Medicare Part B? UPDATED Mar. 6, 2019. The first, and probably the most important for you Medicare choice, will be whether or not you need Medicare Part B coverage. If you elect to keep Part B coverage, you will be entitled to all Part B services. Medicare Part B is not mandatory. 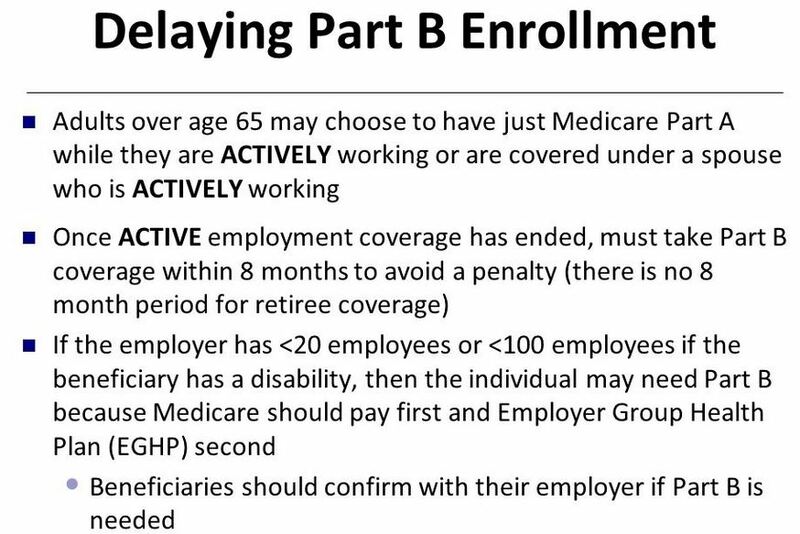 Delayed Medicare Part B Enrollment – Liberty Medicare Video. You may find the script for this video in Initial Enrollment Period (IEP) and Delayed Medicare Part B Enrollment. Can you justify paying the Part B premium? Are you or your spouse (of any age) currently working? Are you covered by an employer or union group health plan based on your current employment status? Is Medicare the Secondary Payer? Will you be ready to enroll in a Medicare Supplement (Medigap) within 6-months of enrolling in Medicare Part B? If there is no particular reason why you should delay enrollment, you should keep Part B because postponing enrollment until the next General Enrollment Period will result in a penalty for as long as you have Part B (10% for each 12-month period in which you were entitled to Part B coverage, but did not enroll). If you are currently working and covered by an employer health plan, you may want to consider delaying Part B enrollment since you will not be penalized for a delay under these special circumstances. Do it ONLY if Medicare is the Secondary Payer; otherwise, your employer plan may refuse to make payments until Medicare pays. The decision whether to keep Medicare Part B is critical. The wrong Medicare choice can create consequences in the future that may be difficult or impossible to reverse. Liberty Medicare would like to help you make this decision. Contact our agency, or for free assistance give us a call at 877-657-7477, and you will be connected to a licensed agent/broker. Do you need Medicare Part D? Should you enroll in Medigap Policy?